I recently picked up a box of Julie's "Juliette" Ice Cream Sandwiches at Whole Foods. I've seen other ice cream sandwiches for sale at the supermarket, but they tend to either be incredibly high in calorie, or full of artificial sweeteners and other schtuff, so I had yet to find one that I felt like trying. But, Julie's ice cream sandwiches are different, and different in many good ways! Not only are they very low in calorie (100 calories/sandwich or 2 WW points), they are also made with real, ice cream! Yes, I did say real ice cream -- made with all natural ingredients, so for those of you that don't like soy ice cream or low calorie frozen yogurt, you will find that they are tasty, creamy, rich and yummy beyond belief. I buy Julie's ice cream sandwiches at Whole Foods. Make sure you buy the ones that are 100 calories (there are bigger ones too, that contain ~160 calories). Compared to other sandwiches available at the you may find them to be somewhat more petite, but if you cherish every bite (they are sooooo yummy! ), you will find it was well worth it to eat these over the artificial stuff. By the way, if you are in the mood for a fruity dessert, it is also worth checking out Julie's sorbet bars while you are in the freezer aisle. Enjoy these special & yummy treats! PS. 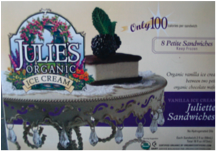 Despite the similarity in name (Julie vs. Juliet), I want to point out that I am not affiliated with Julie's ice cream. I just tried these for the first time today. I think they are *really* good, even by the standards of non-diet food! I am absolutely addicted to ice cream and these are so delicious, plus they allow me limit myself to one serving, whereas before I would eat a whole pint of ice cream in one sitting. They certainly hit the spot when I need some ice cream and I don't feel guilty eating only one of them! Where is the VP of Julie's Organic, Mark Guftason? I think they sent him home. Not to mention, they are Gluten-Free-this is huge for us! !